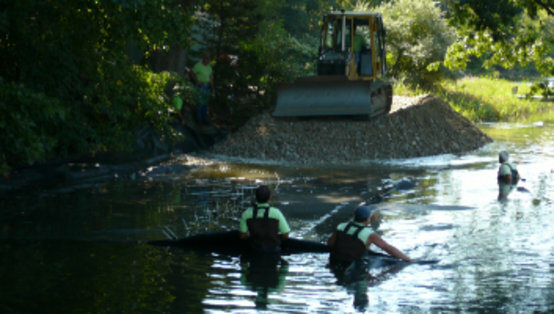 Plymouth Emergency Bypass - Complete bypass of 30” sewer force main with approximately 10-miles of 18” fused HDPE pipe, preserving historic downtown Plymouth, EPA-protected spawning sites and drinking water sources. 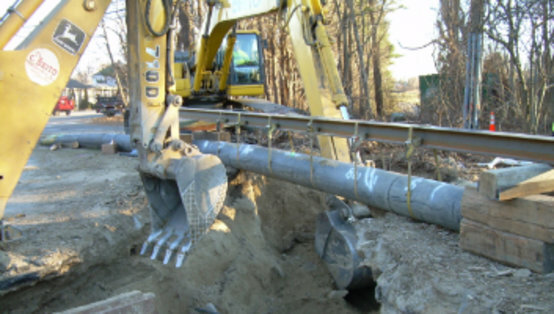 Warwick Emergency Project - Cedar Swamp Road - Repair of a 48” RCP collapse and pumping station failure, shoring the site by driving steel sheeting and dewatering. Long Wharf Force Main Repair Project - Complete bypass of 36” sewer force main with 37,000’ of 18” fused HDPE pipe, including tie-ins at 4 heavy-flow pump stations avoiding millions of dollars in fines and catastrophic pollution of Newport Harbor. C. Brito Construction Co., Inc. established a fusing & staging area on a nearby railway where lengths were fused and and then pulled by train alongside the tracks by a custom built hoisting arm mounted on a railcar. Replacement of Sewer Force Main - Bypass of 7920’ of 24” PCCP sewer force main with 18” fused HDPE pipe and installation of a 24” DI with epoxy-coated interior replacement sewer force main. Smith Cove Emergency Sewer Force Main Repair - Repair of a leaking 14” cast iron sewer force main located 45’ offshore under the Smith Cove tidal basin by construction of a temporary access road composed of stone and crane mats, installation of a temporary cofferdam utilizing a rough terrain crane, and dewatering of the river utilizing 2-stage well points to access the break. With the expertise of 60 years in the industry, C. Brito Construction Co. and CB Utility Co., Inc. are second to none in emergency utility response. Visit us at CB-Utility.com for more further information and media coverage. Contact C. Brito Construction Co. / C.B. Utility Co., Inc. 24 hours per day, 7 days a week at (401) 639-1577.